Jaskirat Singh Sidhu has no comment as he enters court with his lawyers. Court set to open in minutes. 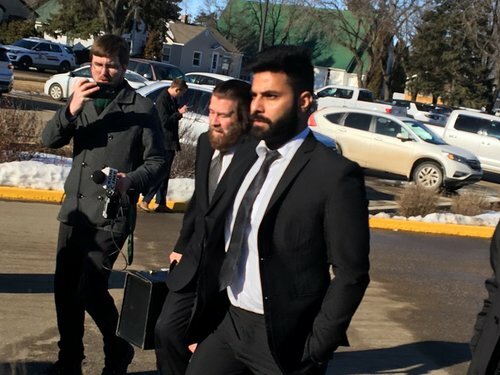 Sentencing of semi driver in Humboldt Broncos crash, Jaskirat Singh Sidhu, about to begin. Sidhu, lawyers, families have take. Their seats. Supporters handing packs of tissue to families in the gallery, many of them wearing Broncos yellow jerseys with their loved one’s name on the back. Again, Crown asking for 10 year prison term. Defence made no recommendation, said Sidhu will accept whatever sentence court deems appropriate. But cases cited ranged from 18mo-4yrs. Judge Inez Cardinal takes her seat, says good morning. She says she wants to remind everyone “decorum will prevail.” No talking, outbursts, etc. Notes Sidhu pleaded guilty to all 29 counts of dangerous driving, followed by theee day sentencing hearing in Jan.
Now again reviews agreed statement of facts. No cel phone, drinking or speeding as factors. Now reading names of the 29 dead and injured - Broncos players, coaches, announcer, driver, athletic therapist, etc. Re:victim impact statements, Cardinal says she must consider them. There were nearly 100 in this case. She thanked them for sharing their experiences, their pain, their stories. Families in gallery listening silently, many with heads down and shoulders slumped. Some supporters placing a hand on their backs. Now on to Sidhu’s perspective. Cardinal notes Sidhu was “unfortunately” preoccupied with the flapping tarp behind him, failing to notice the road signs. Notes Sidhu has complied with all court orders and has no record. Now the lawyers’ positions- 10yr request from Crown and defence citing cases 18mo-4yrs. Lawyers all agree jail time is warranted. Cardinal now reviewing Criminal Code. Said one is not innocent simply bc the consequences are not foreseeable. Driving offences are unique bc many are committed by otherwise law abiding people. That said, they are definitely a crime. Said a just sentence is important for public confidence in the system. Proportionality is also important, must account for level of responsibility/guilt of the offender. Crash occurred before changes to crim code. Dangerous driving causing death can now result in a life sentence. Now re: purpose of sentencing. Says most important principle is to ensure a safe and just society. Re:mitigating factors: noted Sidhu pleaded guilty and saved the system time and money, but most importantly saved families the pain of a trial. Said his clean driving and crim record and lack of drinking and cel use are important factors as well.